There’s been a lot of action this month at the brick building straddling the corner of 10th Avenue East and East Miller Street, once home to the popular French bistro Cassis, followed by its successor XO Bistro and — for the past three years — known for its tapas as Tidbit. Old-timers might remember this spot from its halcyon days as Rain City Grill. North Capitol Hill neighbors will know it as the place with the little parking lot in back offering easy access to yet another succession of even smaller restaurants: Spaghetti Reds, Cellar Bistro and most recently, the pan-Asian-inspired Huiyona. Well, this just in from the “good news, bad news” department: Tidbit has vacated the premises and relocated to a more central Capitol Hill location. 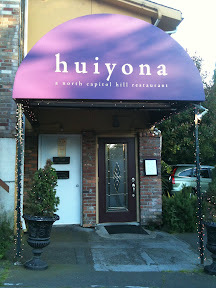 The yearling Huiyona closed its doors for good Saturday night. And Cassis — shuttered in 2004 after a lengthy run — is back in business elsewhere as a catering company. Tidbit owners Nicola Longo (far left) and John van Deinse, now running Tidbit at 1401 Broadway. Their former neighbors, Rachel and Mark Apuyan (right) shuttered Huiyona Saturday night. It’s been a tough go for Rachel and Mark Apuyan. Despite positive reviews and great food (I’ll miss those housemade steamed buns with crispy pork belly), business wasn’t sustainable, says Rachel, who’s fortunately kept her day job. Her husband, and their chef Michael Lopata, are on the lookout for work and each have interviews scheduled this week (my two-cents: hire ’em!). Today, Tidbit’s rustic decor echoes that of the original La Spiga, Vi Bacchus’s sushi case is chilling a selection of tapas, and chef Kurt Stolte has a much bigger kitchen to create his Mediterranean menu, heavily influenced by the flavors of Spain and Southern Italy. Lower prices reflect a change in customer demographic, the owners say. 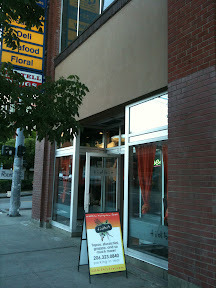 The new Tidbit restaurant and bar, viewed on opening night from the outside and in, made its debut last Thursday, July 8. It’s been a smooth move for Longo and van Deinse, who closed their bistro July 3 and reopened in the new location days later. They remain open for dinner daily, with lunch set to make its debut in a few weeks. Another plus? Free validated parking in the Harvard Market lot. As for the new Cassis, its resurrection as a catering-only company is underway, with original owner Jef Fike and his longtime chef Charlie Durham — late of the Sand Point Grill — at the helm. Fike opened Cassis with partners in 1997, later bought them out and then opened a second effort, Bandol — a bistro and catering company in Pioneer Square. Slow to open and quick to close, Bandol anchored the Smith Tower at a time when restaurants everywhere were feeling the pinch. In the wake of that financial fiasco, Cassis lost its footing as well. “After Bandol went under, I sold Cassis to pay off debt,” explains Fike, a Seattle native who moved to San Francisco after his restaurants’ closure. After five years there, working in the food biz, Fike says, he realized he’d left his heart in Seattle. “I missed my family and my peeps, so I came back to The Ruins, where I worked before starting Cassis.” He’s been the catering director there since. On July 15, Fike and Durham celebrate the launch of their new business union with a fund-raising party at the Georgetown Studios, offering old favorites like the Cassis Cocktail, cassoulet, coq au vin and pommes frites. The cost: $100 a head. The benefactor? Their nascent business. The door at the original Tidbit, and its back-of-the-building neighbor Huiyona, no longer operating on north Capitol Hill.